Night scenes in the beautiful city of 苏州Suzhou. This medium-size city with its small canals criss-crossing along its streets and alleys is one of the most wonderful place I ever visited. I always come here to relax everytime I return to China. I am starting this Video section with this clip of a Great Wall — because it is short and enough. This 明朝Ming Dynasty Wall is about 40 km. southwest of 银川市Yinchuan city, the provincial capital city of 宁夏回族自治区Ningxia Hui Autonomous Region, and runs 80 km. along the south side of 贺兰山Helan Shan, the mountain range that separates northwest Ningxia and Neimenggu (Inner Mongolia). As you will see, the area has nothing but bare mountains and a highway. Crossing this Pass will literally put you on Neimenggu's ground. Historically, Mongolian horsemen crossed this openning on their way south to attack the Central Plains, so the pass has been of great military importance. For photos/stock images and travel information on this Wall, see Sanguankou Pass Picture Gallery. Short video of this earthen Wall that runs through the windy and sparsly duned desert within the great bend of 黄河Huanghe (Yellow River), a region known as the Ordos. This had been frequently used by invading northern nomads, mainly the 匈奴Xiongnu, as a stepping stone toward invading the Han capitals, such as 西安Xian and 咸阳Xianyang. The Wall lined the frontiers of counties that dotted the southern ordos region. This clip captured the Wall that is in Dingbian, one of the counties of Yulin city. The old folks in Dingbian told me of a temple along the wall, and in the video, I was focused in finding and getting to this sacred place that appeared more often as a mirage that I was almost able to reach. For photos/stock images and travel information on this Wall, see Dingbian Great Wall Picture Gallery. Video clip this wide Inner Mongolia grassland located on the north of the provincial capital, 呼和浩特市Huhehaote (Hohhot) city. I always wanted to see the empty northern plains, spent a few nights on a ger, and ride a stocky Mongolian horse freely toward its neverending horizon. And this is what I did here. For photos/stock images and travel information on this Wall, see Xilamuren Grassland Picture Gallery. I carried along a video camera most of the time while I am on the road in China. It is a great medium to keep a record of things moving. And since more people believe in its reality than still images, having decent footages of all the China tourist spots and historical places I traveled to is a good idea. So I got miles of tape. Editing video clips is time-consuming. I am only one person, so it will take some time to get some up. 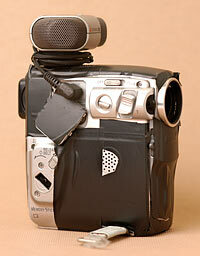 The machine I used for these videos is the Sony 109 miniDV. For better sound I attached Sony ECM-S930C microphone on it.